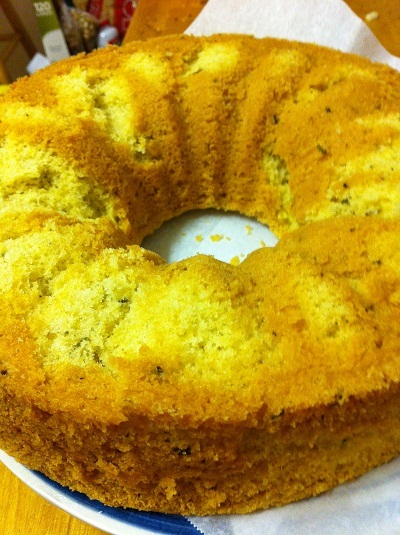 Rosemary Olive Oil Cake — Mel bakes things. First off, you're stuck with iPhone pictures for the time being. I really am sorry...I know they're not great quality. I'm sure you'll survive though. I sure hope so. Anyway, when I started this blog, I told myself that I would share both kitchen successes and kitchen fails with you. This one may be somewhere in the middle, perhaps leaning toward the fail end of the spectrum. I stumbled upon this recipe whilst perusing Tastespotting, as I often do, and decided that it sounded interesting. I'm not a huge lets-mess-with-something-normally-sweet-and-turn-it-savory person, but it was a simple looking recipe and...well, sometimes you just have to step out of your comfort zone and try something new. Since the recipe required almost no work, B (you should read his blog too!) helped me throw the batter together while cooking dinner so we could throw it in the oven while we ate. The batter was beautiful and silky, and smelled pretty delicious. The recipe was originally meant for a loaf pan, but the folks in the Tastespotting test kitchen got crafty with a cake pan, so I decided to take it one step further and put the thing in a bundt pan. It even looked beautiful coming out of the oven. All was good until it came time to take the cake out of the pan. FAIL. Let's talk about my bundt pan. It isn't a real one. It's this dinky insert thing you stick in a springform cake pan. It is ugly. The shape is awkward and boring. And try as it may, this damn thing never lives up to it's "non-stick" labeling. I should know this by now. Really. This is probably the 10th cake/bread situation I've tried to bake in this thing. To add to my bunt pan problem, I happen to be notorious for not waiting for things to cool long enough. This is particularly problematic when making cakes, since removing them from the pan too soon often results in cracking, breaking, crumbling, etc. Well, you can see for yourself (above & below) how ugly this sucker turned out. The texture was very much like cornbread, which I don't necessarily mind. A little dry, but I can deal with that. As for the taste...well...the flavor isn't bad. But it's nothing spectacular. I do think you could pretty easily jazz it up to be great. Maybe incorporate some meyer lemons somehow. Or whatever other flavors complement rosemary...please share if you have ideas, because honestly, the only thing that pops into my head is chicken and potatoes. Chicken-potato-cake? Barf. No thanks. Anyway, despite my fail, I'd encourage you to try this and somehow, get creative with it. I'd be interested to hear what variations work out. You can find the full recipe here.